TALK ABOUT YOUR SUMMER, REHABBING YOUR SHOULDER AND HOW YOU FEEL ABOUT YOUR HEALTH AS YOU GET READY TO GO THIS SEASON. ADRIAN PETERSON: Summer went pretty good, came in with a different attitude, after the shoulder injury and everything. Been working hard to get my shoulder back together for the season. Summer went pretty good and just looking forward to the season. IS THE SHOULDER AS GOOD AS YOU’VE HAD IT IN A WHILE? ADRIAN PETERSON: Yeah, it is. WHAT’S DIFFERENT ABOUT YOUR ATTITUDE? ADRIAN PETERSON: Just with the shoulder injury, it made me realize a lot that anything can happen, so, with a more positive attitude about the situation with my shoulder and everything, I went in working harder to get stronger and prevent injuries like this from happening again. YOUR COACH MENTIONED THAT SCHMITTY HAS SAID THAT YOU’VE TAKEN ON MORE OF A LEADERSHIP ROLE IN THE WEIGHT ROOM. DO YOU FEEL LIKE EVEN THOUGH YOU’RE A YOUNG PLAYER THAT YOU ARE MORE OF A LEADER, THAT THAT IS YOUR RESPONSIBILITY? ADRIAN PETERSON: Yeah, I do. I realize that a lot of guys look up to me, older guys. And the younger guys look up to me, always asking me different questions and asking me about things, how to handle a situation. I’m young and everything, but a leadership role is put on me, so I have to take a stand. YOU COME IN WITH A LOT OF NEW OFFENSIVE LINEMEN AND A NEW QUARTERBACK. DO YOU FEEL YOU HAVE TO REPEAT LAST YEAR’S PERFORMANCE OR WHAT IS YOUR FEELING ABOUT THAT? ADRIAN PETERSON: I’m just going to go out there and play hard, run the ball like I always do. We’ve got some great size with the young guys coming up, they’re going to fill the spots. I feel like they’re gonna get their job done, I’m just going to go out there and take care of business. WHAT DO YOU WANT TO IMPROVE ON THIS SEASON? ADRIAN PETERSON: Catching the ball, running with the ball, work on my shoulders getting lower, basically the all-around game. ADRIAN PETERSON: Basically, it’s hard, but you’ve got to get in the mindset of doing it. It’s hard to work on, but I know I have to do it, control myself, be patient, let things develop. THE COACHES TALKED ABOUT YOU HAVING AN EXPANDED ROLE IN THE OFFENSE. DO YOU LOOK FORWARD TO IT AND THINK YOU CAN HANDLE IT? ADRIAN PETERSON: I’m looking forward to it and I think I can handle it. WILL WE SEE A DIFFERENT STYLE FROM YOU THIS YEAR, OR WILL YOU BE THE SAME GUY YOU WERE LAST YEAR? ADRIAN PETERSON: It’s a little bit different, but it’ll be the same style. Got to work on seeing the hole. I’ve just got to be smarter about different situations I put myself in, not always initiating the contact, save my body. That’s basically going to be the difference. HAS IT BEEN ANY CRAZIER DURING THE OFF-SEASON THAN IT WAS DURING THE SEASON? YOU TALKED ABOUT PEOPLE JUMPING OUT OF THE BUSHES TO GET YOUR AUTOGRAPH. HAS IT BEEN THE SAME THING THE LAST FEW MONTHS? ADRIAN PETERSON: Yeah, it’s been crazy. I’ve been keeping kind of low key. Just chillin’. Just chillin’. COACHES TALK ABOUT HAVING TO WATCH WHO COMES AROUND YOU AND YOU HAVE TO WATCH OUT FOR YOURSELF A LOT NOW. HAVE YOU BECOME ACCUSTOMED TO THAT? ADRIAN PETERSON: Yeah, I’m used to it. It’s not a good position to be in, knowing that everybody wants to get something from you or not just that everybody wants to get something from you, it’s just that you don’t know. You just have to be cautious about people. I’m used to it. WHAT’S THE BIGGEST CHANGE IN YOU? BIGGER, STRONGER, FASTER? ADRIAN PETERSON: All of them. Trying to get a little bigger. I can probably get stronger, too. At one point, I was about 220, but I’ve lost a little weight. I’ll try to get it back on before the season starts. Right now I’m at about 215. I want to play at 220. WILL THERE BE ANY ADJUSTMENT BECAUSE OF YOUR SHOULDER. ARE YOU CONFIDENT WHEN YOU LOWER THAT SHOULDER AND TAKE A HIT THAT EVERYTHING WILL BE FINE? ADRIAN PETERSON: That’s what I want to test out. I’m going to go out there and run the ball like I normally do and see what happens. WHERE WAS THE TAKE OFF POINT THAT YOU REALLY FELT GOOD LAST YEAR? 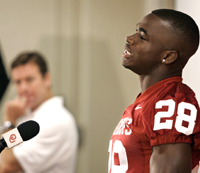 ADRIAN PETERSON: I’d probably say the Oregon game. I got a lot of snaps in that game and as the game went on, I started to feel more comfortable and I just got my rhythm and after that it was almost like I got comfortable and after that, everything started running smooth.